This cozy villa overlooking the bays of Ornos and Korfos offers spectacular panoramic sea views and a convenient proximity to the lovely beach of Ornos as well as to Mykonos Town. 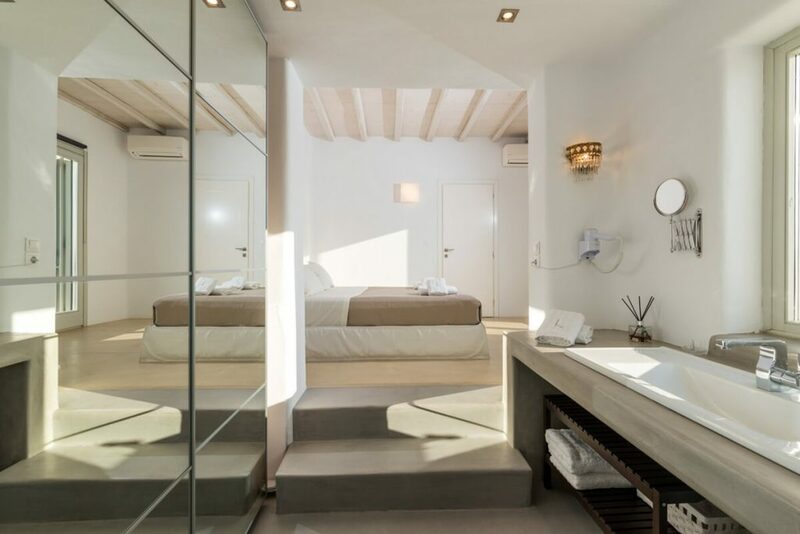 It consists of four bedrooms, two of which are located on the upper level (both with their own shower bathroom and access to the terrace) and two on the lower floor with a shared shower bathroom (one of which also has access to its own garden patio). On the pool level, we find a comfortable dining and sitting area both indoors and outdoors (the lounge external areas are covered by pergolas and are ideal for alfresco dining), a fully-equipped kitchen and a guest bathroom. Due to its proximity to the child-friendly beach of Ornos and its amenities (super market, bakery, butcher etc.) and the close driving distance to Mykonos Town, this villa is the ideal holiday home for families.